I took this moody shot on an overcast day in Somerset. 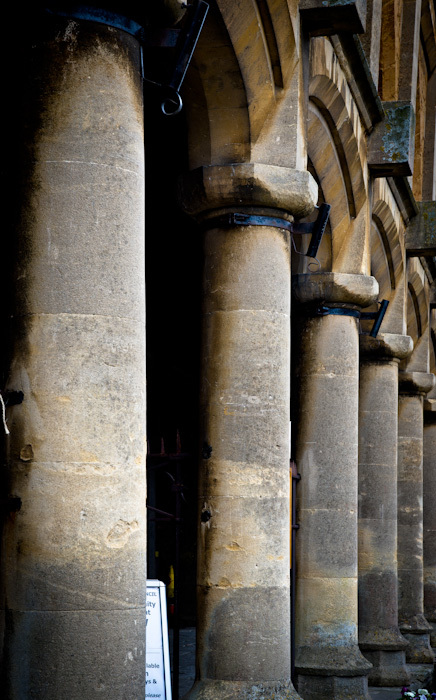 It shows a detail of the Market House in Castle Cary. The architecture gives a feeling of great history, as though it dates to the medieval era. However, although the town has had a market here for over 500 years, this structure was erected in 1855, to replace a much older building and take advantage of the arrival of the railway. No doubt the style of the architecture of the 'new' building took account of the history of the place and was possibly influenced by that trend in the Victorian era to seek inspiration from historical styles. I enjoyed the subdued light, as it gives the stonework a sense of heft and gravitas.